It has already been explained that a higher indifference curve shows a higher level of satisfaction than a lower one. 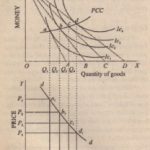 A rational consumer will, therefore, try to reach the highest possible indifference curve in order to obtain the highest possible of satisfaction. In this pursuit, our consumer will he governed the mount of Mulroney or income he has to on goods, and the paces of the in the market. Suppose our consumer has Rs. 15 spend on apples and mangoes. 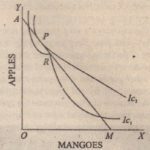 Further suppose that the price of mangoes in the market is Rs. 1.50 per unit and the price of apples is per unit. With mangoes and no apples or 15 apple and nu mangoes . By joining points A and M, we get what is called Price c. It is also called conning. 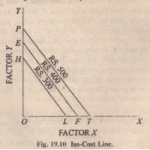 or Budget Line or Line, This line shows all possible combinations of two goods (in our case apples and mangoes) that the consumer can buy if he spends the whole . Thus. at our consumer will be having 2 mangoes and and will all his money (Rs, 15) on the two good mangoes.